We have all seen the explosive economic growth that occurs where two Interstate highways intersect. Throughout western Missouri, Arkansas and Louisiana we have the opportunity to experience this economic growth with the completion of I-49. With I-49 connecting to I-29 North in Kansas City, 1700 miles of Interstate highway between New Orleans and Winnipeg, Canada is now 80% complete. The longest unfinished section is 145 miles between Fort Smith and Texarkana in Arkansas. The completion of I-49 will have a dynamic effect on our region, and we must have an organized effort to secure funding through the political process. 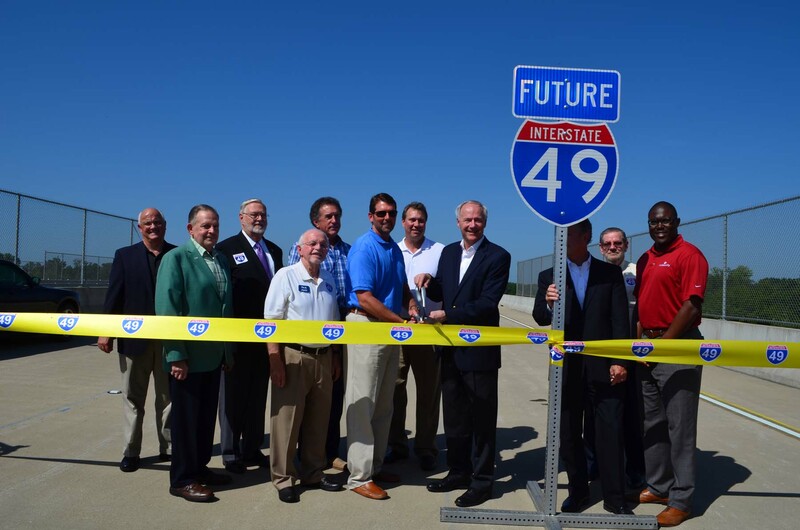 The I-49 International Coalition has been and will continue spearheading this effort. To help our region reach its full potential, we invite you to join the I-49 International Coalition. Just click on this membership form, then complete and return it. Don’t sit and watch! Participate and take action in the completion of I-49!! Interstate 49 is the Congressionally-designated High Priority Corridor # 1 that will connect Kansas City and New Orleans; connecting in Kansas City with I-29 North, it will create a 1700 - mile uninterrupted Interstate Highway from Winnipeg, Canada, through the heart of America to New Orleans - - and through the port system of Louisiana, to Central and South America where trade and traffic are expected to triple in the next decade with expansion of the Panama Canal. From Winnipeg, going South, this Interstate trade route intersects existing East – West Interstates I-94 (Fargo), I-90 (Sioux Falls), I-80 (Omaha), I-70 (Kansas City), I-44 (Joplin), I-40 (Fort Smith), I-30 (Texarkana), I-20 (Shreveport), and I-10 (Lafayette) on the way to New Orleans and other ports on the Gulf Coast. The result is a comprehensive transportation grid to enhance the movement of food, goods, energy and people to and from anywhere in Mid – America and the rest of the world. All of America, and especially Mid – America, will benefit from increased safety, trade, tourism and economic development upon completion of I-49. The I-49 International Coalition was organized in December, 2002, joining groups in Louisiana, Arkansas and Missouri (each promoting its local unfinished section of I-49), to collectively promote completion of the entire High Priority Corridor # 1 from Kansas City to New Orleans. The Coalition presently has over 100 members: cities, counties, Chambers of Commerce, associations, businesses and individuals - - and welcomes additional members who share our interests. Interstates aren't built in a day, a year, or sometimes even in decades. But it takes the work of dedicated community leaders and legislators to get it done. 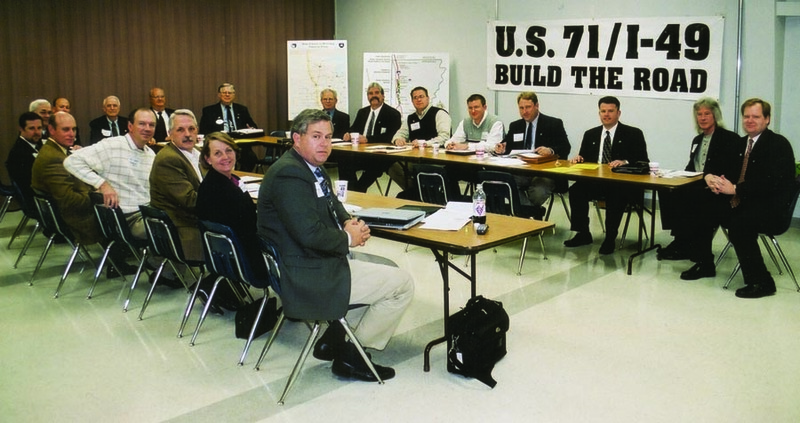 Kevin Welch, Director of the Joplin Regional Partnership shared this photo of an I-49 International Coalition meeting taken circa 2003. We've come a long way since then. Let's work to see it through to the end within the next decade! Show your support of I-49 - Sign the petition today! Help us demonstrate to elected officials that people from states across the nation support the completion of I-49. Information collected will not be shared with any other entity or used for any other purpose. Sign the I-49 petition here.